Biscuits and Gravy made with breakfast sausage, milk, and seasoning, served over flakey buttermilk biscuits is a quick and easy breakfast ready in only 20 minutes! 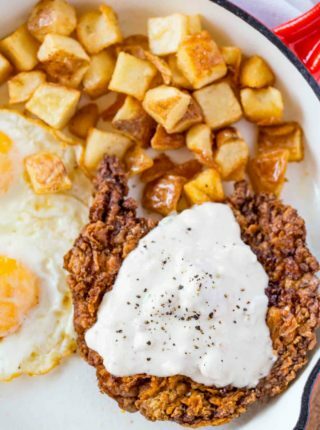 Classic southern food is a favorite in this house, and right now we’re perfecting our Buttermilk Biscuits, Pulled Pork, and Chicken Fried Steak. 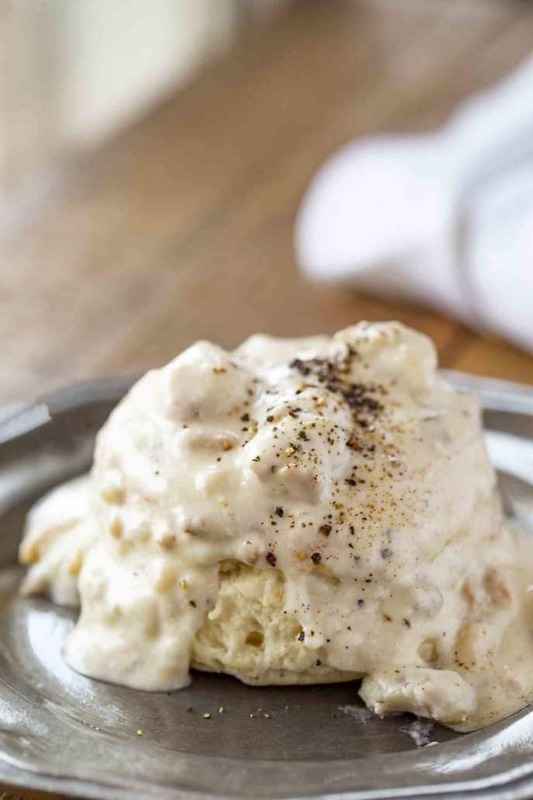 Biscuits and Gravy are a classic southern breakfast made with sausage gravy and spooned over light and fluffy buttermilk biscuits. It’s basically a serving of heaven on bread, which is probably why it’s so popular. This is the PERFECT recipe to make with leftovers the night after you serve biscuits for dinner. Traditionally this is made with sausage, but you can swap that our for other meat in this recipe if you have leftover ground beef or turkey from dinner, too. I’ve also added other spices to this recipe before, like thyme and sage. The sausage itself has a lot of seasoning, so you don’t need much to make this gravy work. This is also the perfect recipe to feed a crowd. 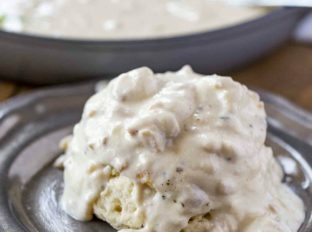 All you need is a large batch of buttermilk biscuits and a pot of sausage gravy, both of which are quick and easy to throw together. A good biscuits and gravy recipe traditionally uses sausage gravy made from breakfast sausage or ground pork sausage. You can use spicy sausage or sweet sausage, depending on your own preference. If you go for breakfast sausage, the flavor can range from spicy to more maple. Any of these would work in a sausage gravy. 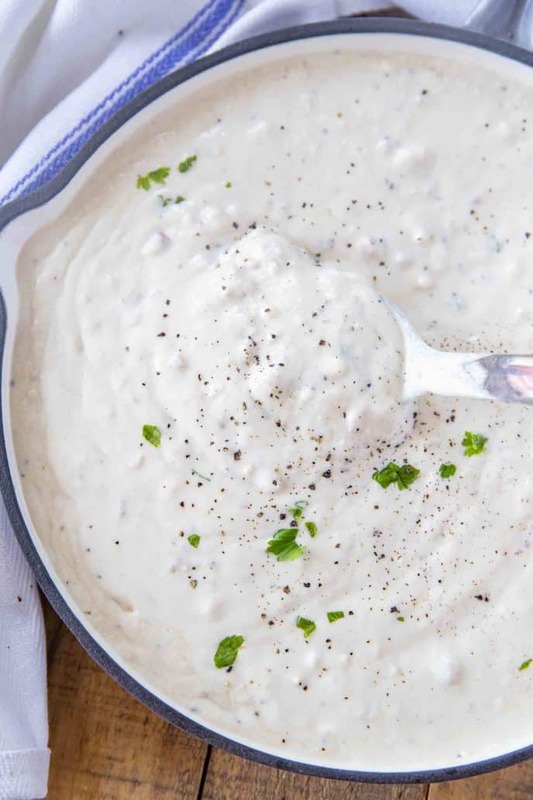 Milk is going to give your homemade sausage gravy a rich, white color and creamy texture. 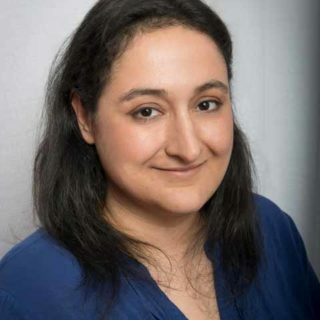 If you can’t do dairy, you can use unsweetened plain almond milk, but the gravy will be a little bit thinner and more clear than the dairy version. If you don’t care as much about the color of your sausage gravy, try using some vegetable or chicken broth in place of the milk, and simmer the gravy until it thickens. 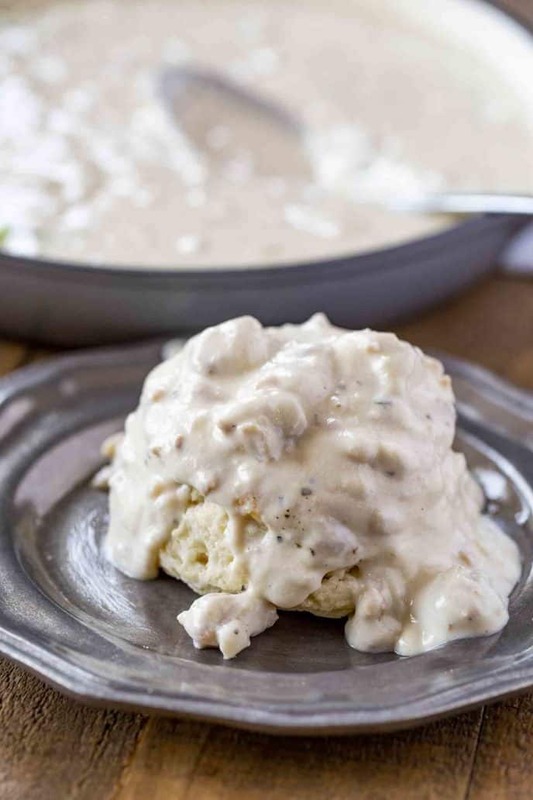 If your biscuits are separate from the sausage gravy, wrap the biscuits in tinfoil and place in the oven at 300 degrees for 5-8 minutes, or until they are warmed through. While the biscuits are warming, put the sausage gravy in a skillet over medium heat. Stir, adding a few tablespoons of warm water as needed, until the gravy is warmed through. 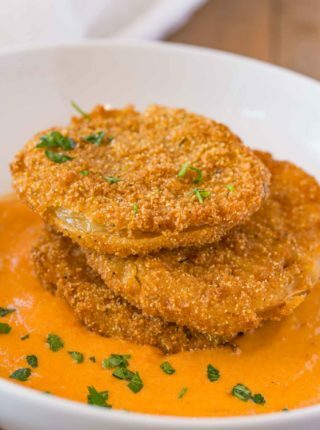 Pour on top of biscuits and serve. Another method is to heat the sausage gravy in a skillet over medium heat. Cut the biscuits in half and layer on top of the sausage gravy, then cover the pan for 3-4 minutes, or until everything is cooked through. You can replace the pork sausage in this recipe for bacon. Just cut the bacon into pieces, fry in a skillet until cooked through, then follow the recipe just as you would for the sausage. If the bacon adds too much grease, pour some of it off before adding the 1/3 cup all purpose flour. It should be fairly close to the sausage, though. Save the grease from your sausage for the gravy recipe. 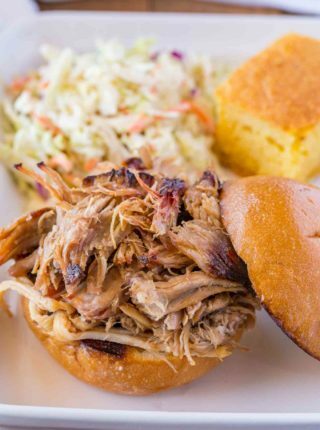 This adds a TON of flavor and a really authentic southern feel. If you don’t have enough to make a sauce, add a tablespoon of butter or shortening and cook until melted before adding the flour. After you add the flour to the grease, whisk continuously until the flour has a chance to cook. The mixture will smell slightly nutty, and the flour will start to brown. Then you can start adding liquid and simmer to thicken your sauce. Stick with whole milk or cream for this recipe. Gravy is all about fat as flavor, if you use skim milk the dish just won’t be the same. Don’t skip the pepper. In fact, add more pepper to taste, then add a sprinkle of pepper on top, too. Black pepper is one of the signature flavors in this dish. You can make gravy without pork sausage or bacon, instead use lean beef or ground turkey to lighten it up. It will need butter to make the roux, though. Brown the sausage in a large skillet on medium high heat, crumbling into small chunks while cooking. Add in the flour and whisk until the fat is all soaked up and keep whisking while pouring in milk slowly. Add salt and pepper and let thicken while whisking for 5-6 minutes. Add the dry ingredients to a food processor and pulse several times until well combined. Add in the butter and buttermilk to the food processor and pulse until combined. Put the mixture onto a floured surface and form into a ball. Roll it out 1/2 inch thick. Fold dough over on one side, then the other, creating three layers. Pat it down, then fold it over three ways again. Repeat folding and patting once more. Gently roll out. Using a 3 inch biscuit cutter cut out 10 biscuits. 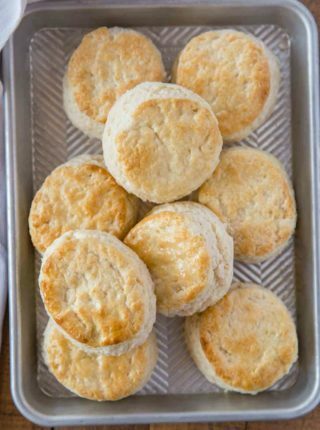 Place the biscuits on your baking sheet, brush with remaining buttermilk and bake for 15-17 minutes. Made the gravy this morning; I’ve cooked for years and years but never once have I made sausage gravy, and this was DELISH. So easy and flavorful. So glad you enjoyed it, Victoria! Many times when I’ve wanted “milk” gravy and didn’t have any milk I’ve used water or broth and coffee creamer. We sometimes have this for dinner at my house, and my kids love it! You’re right about the pepper. It may seem like a lot, but the end result tastes so good! That plate of biscuit and gravy is calling my name! Thanks for all the tips and info! Is there a better breakfast out there then biscuits and gravy? Seriously looks amazing!